The OneFlorida Clinical Research Consortium is a complex and robust research infrastructure that allows researchers, clinicians, patients and stakeholders to join forces across the state to address some of Florida’s biggest health challenges. Led by Elizabeth Shenkman, Ph.D., and David R. Nelson, M.D., through the UF CTSI, dozens of individuals spanning numerous institutions have collaborated to develop a framework for research infrastructure that can serve the entire state — including health system, state agency and community leaders, researchers, clinicians, human-subject protection experts, informatics experts, patients and caregivers. Formed in 2013, the OneFlorida Clinical Research Consortium collaboratively integrates and expands programs developed by the UF CTSI and its partners. Bond Community Health Center Inc. Together, OneFlorida partners provide health care to more than 40 percent of Floridians in what is now the nation’s third largest state. OneFlorida partners encompass 22 hospitals, 1,240 practice/clinic settings and more than 4,100 physicians, which provide care for 10 million patients across all of Florida’s 67 counties. The OneFlorida Clinical Research Consortium was recently designated as one of the nation’s 13 clinical data research networks, or CDRNs, by the Patient-Centered Outcomes Research Institute (PCORI) to accelerate the translation of promising research findings into improved patient care. The PCORI Board of Governors approved more than $7.5 million to support the ongoing development and expansion of the OneFlorida Data Trust and its involvement in PCORnet, the National Patient-Centered Clinical Research Network. The funds included support to add seven health data networks to this large, collaborative initiative, which is designed to link researchers, patients, communities, clinicians, and health systems in productive research partnerships that leverage the power of big data. The strength of the consortium is in its diversity. Research is conducted in real-world settings and results can be implemented in the consortium’s practices to promote the uptake and sustainability of evidence-based health-care practices. The OneFlorida Clinical Research Consortium offers investigators the opportunity to engage in research with ethnically, racially and geographically diverse populations across the state of Florida. With its aging and diverse population, Florida, in many respects, represents the America of tomorrow, making it an ideal setting for real-world scientific research. Research queries can be conducted using deidentified patient records in the OneFlorida Data Trust, which assists with hypothesis generation and study feasibility assessments. The consortium also provides researchers with much-needed support in implementing grant-funded research in real-world settings. From assisting with practice facilitation to disseminating findings to various audiences, OneFlorida staff members are committed to helping researchers achieve high-quality implementation of pragmatic clinical trials. Research facilitators throughout the state will work individually with participating practices to embed research into clinic workflow and monitor fidelity to the scientific protocol to ensure the highest quality research. The collaborative development of the consortium is being led by the UF CTSI. Currently, the consortium is expanding infrastructure cores to support several research studies in the network as part of PCORnet, PCORI’s national network for conducting clinical data research across the country. 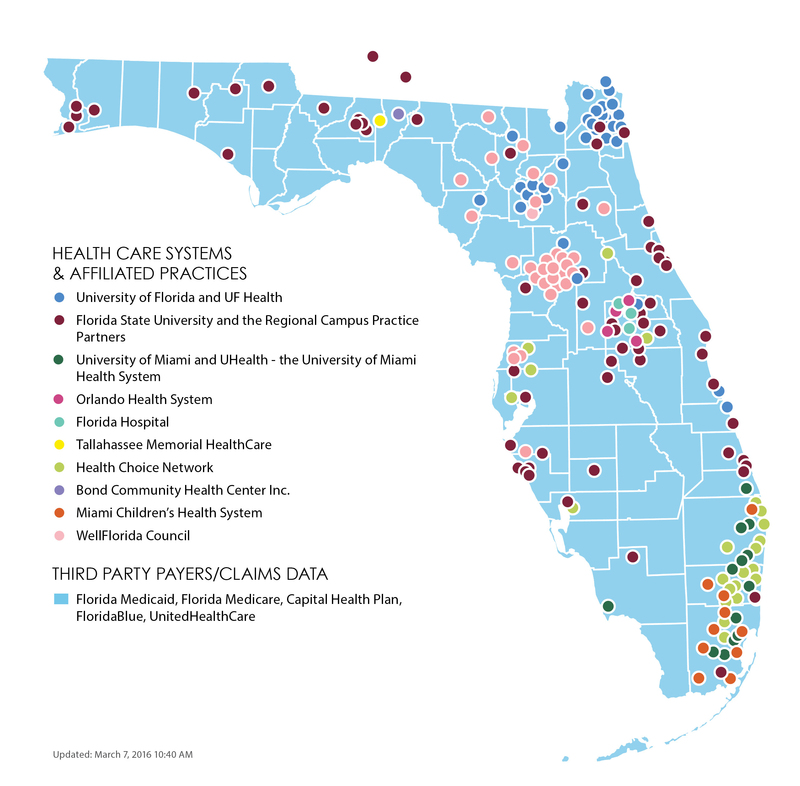 Many of the resources were created by UF and FSU to facilitate the work of Health IMPACTS for Florida, the statewide practice-based research network created by the two universities in 2010. In addition, OneFlorida alliances mobilize efforts around specific health problems, such as tobacco-related diseases. The alliances work to secure funding and facilitate studies to advance their research objectives while simultaneously helping to test, refine and expand the consortium’s research infrastructure. In 2014, the Florida Department of Health’s James and Esther King Biomedical Research Program awarded UF a three-year, $1.6 million grant to form the OneFlorida Cancer Control Alliance to strengthen statewide infrastructure and reduce health disparities in cardiovascular disease and cancer related to tobacco use. The alliance’s Minority Education Program aims to enhance the infrastructure available to Florida scientists with a priority to train mentees from Florida’s historically black colleges and universities (HBCUs) through a mentored research experience that is modeled after the NIH research supplement award. To discuss how to leverage this unique consortium effectively, researchers should contact TaJuana Chisholm, onefloridaoperations@health.ufl.edu or 1-877-477-2341. The UF CTSI and its partners are collaborating to develop statewide research infrastructure for the OneFlorida Clinical Research Consortium while advancing specific research and implementation projects that address important health priorities, engage diverse settings and populations, and help test and refine various parts of the infrastructure. This project utilized the Health IMPACTS network to understand which factors might influence a pediatrician to use health risk assessments (HRAs), as well as understand what encourages or prevents an adolescent patient from fully participating in the assessment. The project aimed to determine what factors impact counseling related to alcohol use, tobacco use, other substance use, sexual activity, depression and weight. Findings were used to develop strategies to improve health care provider performance of and adolescent participation in HRAs. This project utilizes the Health IMPACTS network for (1) implementing an evidence-based concussion assessment and management program to assess the relationship between health risk factors and injury susceptibility, severity, and recovery for youth participating in organized sports activities in Florida communities; (2) teaching community physicians and medical students to apply evidence-based principles for recognition, assessment and management of concussion and mild traumatic brain injury (mTBI) risk in children and youth; and (3) providing education modules for parents, coaches, physicians/health care professionals and the general public that are designed to reduce long-term consequences of mTBI. As part of a genomic medicine implementation project funded by the National Institutes of Health, the CTSI’s UF Health Personalized Medicine Program is working with affiliated community-based health systems to introduce pharmacogenetic testing within their patient care processes. The program also is developing a variety of innovative educational programs for health care providers, students and patients. Funded by the Society for Adolescent Health and Medicine, this project aims to decrease vaccine inequalities among adolescents enrolled in Florida Medicaid and KidCare by addressing barriers related to provider recommendations, cost and concerns about safety. In collaboration with affiliated health care providers, the research team is developing and testing a multifaceted approach to increase awareness about the vaccine among girls and their parents and prompt more doctors to offer it. The consortium formed the OneFlorida Cancer Control Alliance to strengthen statewide infrastructure to reduce health disparities in diseases related to tobacco use. The alliance is funded by a three-year, $1.6 million grant to UF from the Florida Department of Health’s James and Esther King Biomedical Research Program. The infrastructure will enable pragmatic clinical trials and implementation studies in real-world primary care settings with an emphasis on practices serving vulnerable populations. The project includes a pilot implementation study focused on increasing use of evidence-based tobacco-cessation assessments, interventions and referrals during primary care visits. Partners and collaborators include UF, Florida State University and University of Miami and their affiliated health systems and practices, as well as Florida A&M University and Edward Waters College.